This is a guest post from Duane Craig over at Construction Informer. 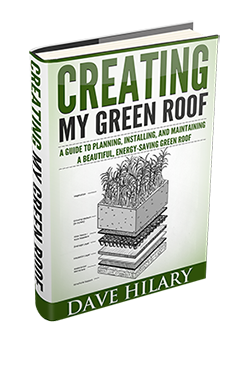 If you want to write a guest post for Green Roof Plan, give us a shout here. Across the globe the green roof initiatives by governments are increasing. Not only are governments planning and installing more green roofs on government buildings, but they are enacting a wide range of legislation that encourages, and in some cases even mandates green roofs. Nowhere is the trend more evident than on the European continent where green has evolved faster than in other developed countries. According to the International Green Roof Association, local authorities and city councils, especially in Germany, have enthusiastically embraced green roofs to help air quality, protect the soil and water and to inject some additional greenery into the lives of the citizens. The governmental bodies are doing this by offering direct financial incentives, reducing storm water taxes and providing relief on density regulations to offset the green roof contributions to open space. Mandatory green roofs in new developments mean sewage treatment and water reservoirs can be reduced in size and scope which lowers construction costs, lowers infrastructure maintenance costs and ultimately lowers the taxes on the population. Green roofs are also seen as compensation for damage to the natural environment that construction causes, thereby reducing or eliminating compensatory charges to developers and builders. Throughout Europe, countries and municipalities are enacting green roof legislation. In Copenhagen it is mandatory for all new flat roofs and any retrofits that use public monies to be vegetated. The Swiss cities of Basel, Zurich and Luzern have mandated green roofs on new flat roofs, and the United Kingdom has established aggressive policies to encourage the use of green roofs and even green walls. In Toronto, Canada a recent green roof law requires any new building to have at least 50 percent of its roof vegetated. There were 36 votes for the measure and only two against. Toronto’s initiative is driven largely by its need to develop more green space. 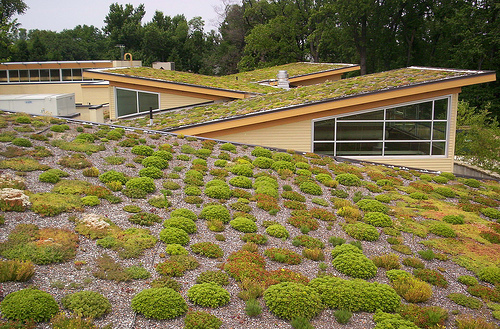 In the United States, green roof initiatives at the government level are gaining momentum. Local building codes often have to be modified to accept green roofs. In Port Orange, Florida, the codes have gotten the green light to allow green roofs. Austin Texas passed legislation to sponsor green roof development research at the Lady Bird Johnson Wildflower center and at the University of Texas. New York City offers tax abatement for buildings that install green roofs, Annapolis, Maryland provides a $10,000 tax credit to those who reduce storm water pollution on their properties, and the city of Chicago, Illinois is by most accounts leading the way in U.S. green roof development with more than 300 projects completed. Los Angeles has published its own green roof guide to encourage more development of them to mitigate city heat and to conserve energy. Milwaukee’s Metropolitan Sewerage district has a regional green roof initiative program to help lower the amount of runoff that goes through the wastewater treatment system, and Portland Oregon has offered grant money for green roof development to help keep roof runoff out of the storm water system, to control invasive plants and to protect environmentally sensitive areas. As more residential and commercial building codes change to accept green roofs you can expect more municipalities, counties and cities to adopt green roof initiatives. This is especially true for cities where managing heat, runoff and building energy costs are becoming the new environmental and fiscal challenges.